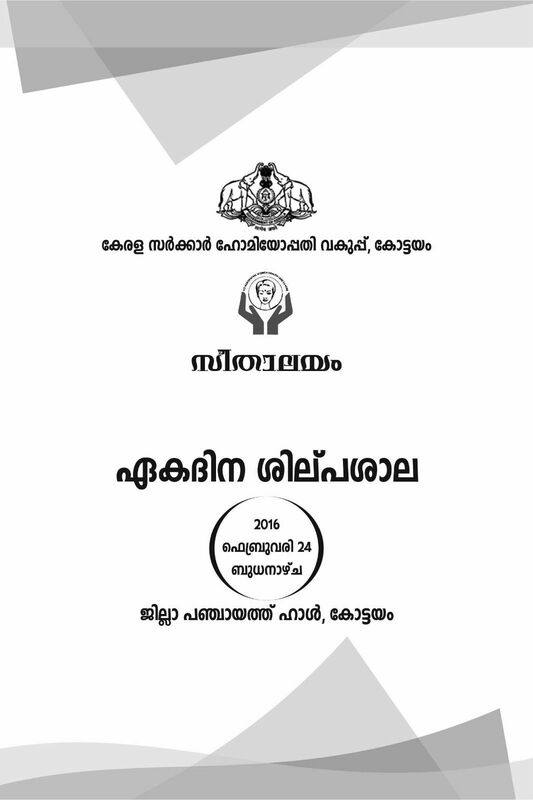 One day seminar on the Seethalayam project on 24th February at District Panchayath Hall, Kottayam,Kerala. The seminar has the standing committe members as participants from various Panchayaths and municipalities of the district. The seminar will be inaugurated by Sri Joshi Philip, the President of Kottayam District Panchayath. The Director of Homeopathy Dr Jamuna and The Superintendent of the Kurichy Hospital Dr Reji will address the gathering. The District Medical Officer Dr.Sreelatha will give the welcome speech. The Seminar is coordinated by Dr.Maya S Rajappan (convener) and Dr.Uma, who are the the medical officers in the Department of Homeopathy,Govt. of Kerala and in-charge of the Seethalayam project of the district. Dr Roy Zacharia will have a introduction on the Seetalayam Project. Dr Sreekumar takes a session on Scope of Homeopathy and various projects and Dr Joby will have a session on infertility management with Homeopathy.Dr Roy Mathew will have a short session dealing with alcoholism. Homoeopathy department, Dept. of AYUSH, Govt. of Kerala had launched the first gender based programme for women Health care – Seethalayam to empower women’s mental, physical and social health. The main aim of the project is to provide aid for suffering women in the society. The majority of ladies are facing physical and mental torture in domestic and social environment. Domestic tortures are mainly due to dowry related issues, nuclear family constrains and substance abuse and problems of infertility. Increasing incidence of suicidal tendencies in women is mainly attributed to their family problems, mental illness, physical Illness and financial problems. It is well proved that Homoeopathy can alleviate mental aberrations and suicidal tendencies with out any bad effects and financial burden. After consultation and detailed interrogation the lady Homoeopathic Physician identifies the actual route cause of the problem and gives necessary treatment and counseling (with the help of a psychologist) if needed treatment is also extended to the family members. In essential cases the person can be admitted in the hospital for strict Homoeopathic care. Along with treatment Seethalayam is committed to provide the multi dimensional supports from the Social and Family Welfare Departments, State Women’s Commission, Home department and other NGOs etc. Working Plan In the first phase were started 3 centers at hospitals in 2010-11 at District Homoeo Hospital, East Fort, Thiruvananthapuram, Thaluk Homoeo Hospital, Kurichi Kottayam and District Homoeo Hospital, Erangikkal, Kozhikkode. Department Started 11 more centre of seethalayam in the remaining 11 districts with the help of one time additoinal Central Assistance in 2011-12. The budget allocation for this years Seethalayam project is 5.9 crores. The recent success of infertility treatments has helped in getting such a budget provision for the scheme.